It’s a Sign, So Let’s talk! Welcome back once again. Today is day #3 of Taylored Expression January release sneak peek. And I am sharing two more cards using two more new products to be released on Thursday. The first product I am showcasing is a stamp set called Give Me A Sign! How cute are these animals holding the sign board? All the variety of sentiments that fit in the sign board. Absolutely adorable set. 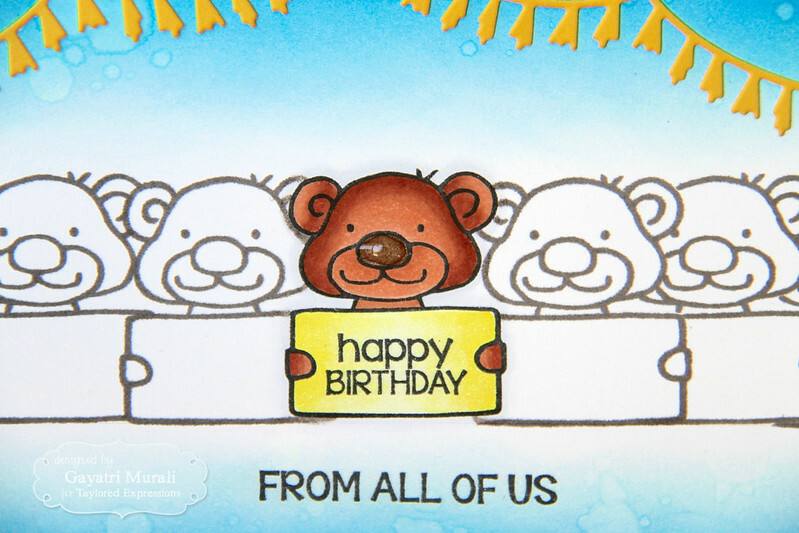 I am showcasing the bear image from the stamp set. I did masking technique to stamp a series of bear image holding the sign board. The image that is in the front is stamped first using Oreo hybrid ink. Then masked the main image to stamp the images beside using Earl Grey dye ink. I repeated the process till the end of the panel. I highlighted the centre main image by colouring with copics. I stamped the Happy Birthday sentiment inside the sign board and the secondary image below the images using Oreo hybrid ink. To celebrate the sentiment I sponged distress inks Salty Ocean, Mermaid Lagoon and Blueprint Sketch on top and bottom of the panel. I added water to get spatter texture on the ink. Then I die cut a Banner die from Skinny Party Border die using Lemon Meringue cardstock to add to the top of the panel. I adhered this panel on a white card base and added glossy accent on the nose of the bear. The second product I am showcasing today is a die called Let’s Talk Edger 3 die. There is already a Let’s Talk Edger 1 and 2 die released last year. This one is the third in the series as it says in the name. 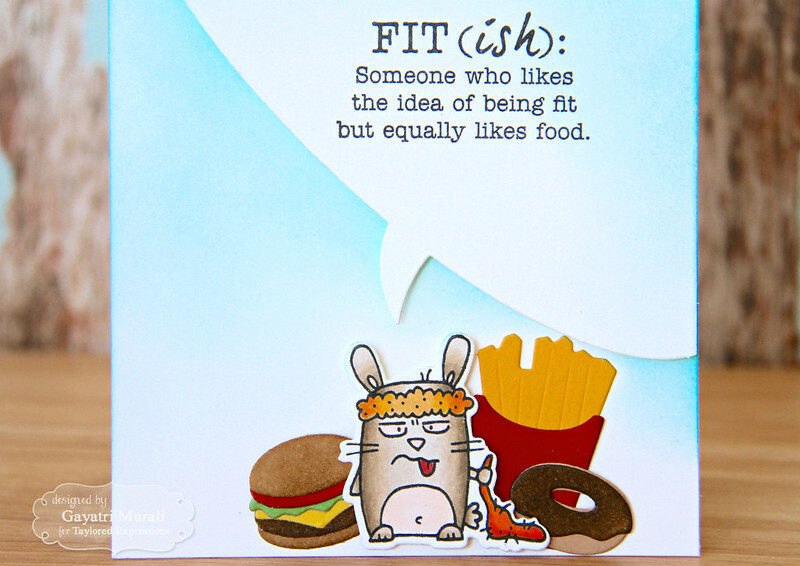 I combined the Let’s Talk Edger 3 die with the new Exercise Grumplings stamp set to make this card. And it is my favourite card in this release. 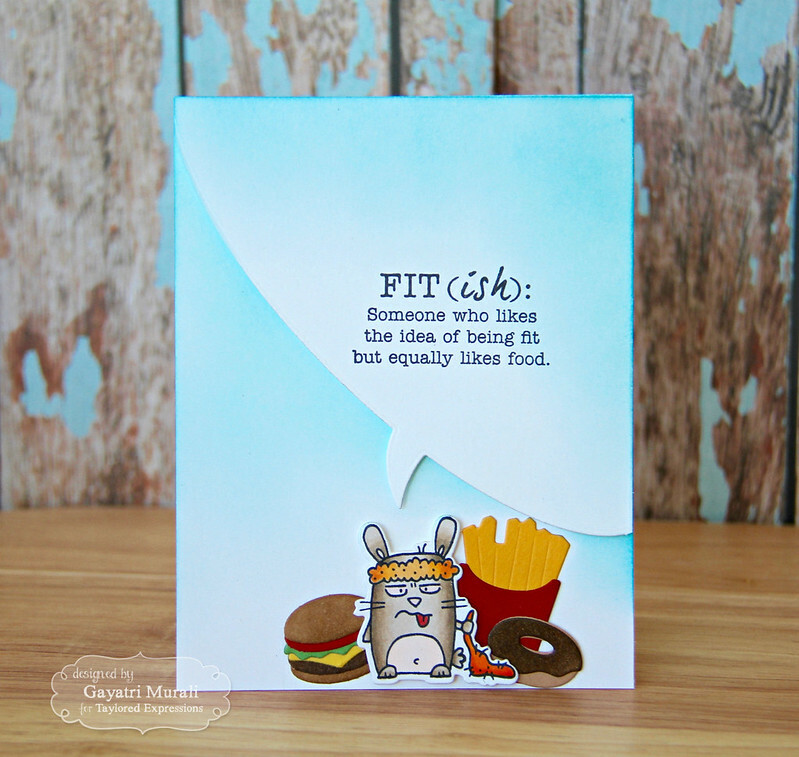 I used the Let’s Talk Edger 3 die at an angle with the sentiment from Exercise Grumplings stamp set. To highlight the sentiment I sponged Peacock Feathers distress inks. This sentiment is fantastic. Gave me the giggle as I can totally relate to it. The focal point has one of the Exercise Grumpling image stamped, copic coloured and die cut using the coordinating die. I combined this image with Little Bits: Donuts, Little Bits: Hamburger and Little Bits: French Fries. I thought they were perfect together for the sentiment. LOVE how this card turned out. The Let’s Talk Edger 3 die is perfect for this card. For a limited time, earn DOUBLE CRAFTY POINTS on our Exercise Grumplings Bundle! If you’re not a Crafty Points member, it’s free and easy to join. Just create an account at the TE webstore and you’re automatically enrolled to begin earning crafty points with every purchase. You’ll earn 82 Crafty Points on the purchase of the Exercise Grumplings Stamp Set and Coordinating Dies Bundle! Offer valid on qualifying purchases made between 7am PST on Thursday, January 12 and 11:59 pm CST on Sunday, January 15, 2016 and only while supplies last. Crafty Points are only available on purchases made via our retail webstore, www.tayloredexpressions.com. While you are there, check out gorgeous inspirations from the rest of the designers using the sneak peek products. Tomorrow is the release day! See you with more TE projects. Absolutely too cute Gayatri, I have one of these sets but seriously have not had a minute to play over Chrissy and New Year, cross my fingers real soon. thanks for the inspiration! 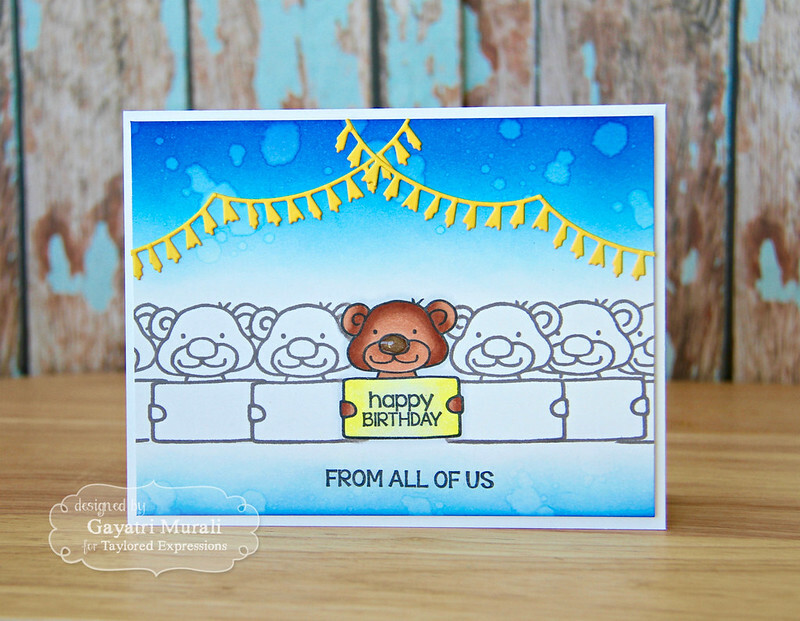 Oh my goodness Gayatri, these are wonderful! WOW. I love the new goodies and your cards are fabulous. Love the signs.